Housemarque, the Finnish studio responsible for games like Super Stardust, Resogun, and most recently Nex Machina, have decided to stop making the arcade-style titles which it was known for. Why? Well, a new blog post spells it out pretty plainly: Arcade is dead. 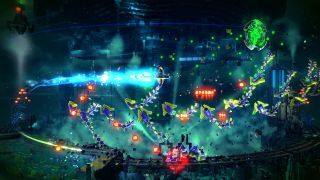 "Lackluster sales of Nex Machina have led us to the thinking that it is time to bring our longstanding commitment to the arcade genre to an end. While this genre will always hold a special place in our hearts, the industry is moving more toward multiplayer experiences with strong, robust communities, and it’s time for Housemarque to move forward with the industry. Hence Nex Machina and Matterfall will be the last of their kind coming out of our studio." All that being said, Housemarque itself isn't going anywhere. Kuittinen writes that the studio will remain committed to making experiences where gameplay comes first. The devs have already started working on a new game, though it's apparently "something totally different than what you might expect," according to the post. Until it's revealed, I suggest you go back and enjoy Housemarque's existing games - and try not to be too sad knowing they're the last of their kind.